I have just read an amazing book. It has come to me at the end of a perfect day and right in tune with conversation and events of today. I don’t even know where to begin. Do I talk about the merits of this book or how it personally affected me? I’ve been wanting to share my reactions to books I have read, I usually forget to. Tonight I figured it was as good as any time to start. There is only 5 laws of success: Value, Compensation, Influence, Authenticity, Receptivity, all told in conversation and then applied in the story. It’s sweet and personable and so simple. As I read this book about the importance of giving more than you expect back, putting other people’s interests first, and being true to who you are. I was delighted that this, put across as business advice, was my spiritual beliefs. It was like applying the Bible to real life, without mention of higher calling, purpose, or any secular thing. I experience the world with God in mind and it was a delight to read this book and think of it as a modernized Proverbs. The thing is though, it fit right with what my friend and I have been talking about. She’s the one that recommended the book to me. We seem to be well in sync in helping each other reach our dreams. I always come up with ideas on new ventures for her to take and she always has insight into how to hone my attitude. Focus. Don’t sweat the small stuff. Forgive yourself. We have talked about how this world is coming into a new way of thinking, of serving and helping and community, of trading for goods and services and getting back into simplicity with the pursuit of happiness and not just materialism. Maybe we’re romantics, idealists, hippies, unrealistic. Whatever you want to call it. But this book was an affirmation to me. My dreams have value, I can succeed without being the typical shrewd businessman. In fact, this book told me that serving and giving IS the law to success. How often have we heard that? How archaic does that sound? I need to hear it over and over and in many different styles and examples and this style was very effective. My friend and I have had fun exchanging books back and forth and passing on contacts. I feel like I get to participate in her moving towards success and I feel she’s helping me towards my success. It’s so exciting. The Go-Giver talks about this and it was like our interaction could be right in this book. The other day I was talking about imitating Monet’s color palette and she gave me a book of his art. I think her inspirations should be in a book so I lent her a book Living with InTention, it is the sort of book I see her writing, and Living with InTention is very encouraging and motivating. When she finished she was inspired to write a book of her own and I was able to hand over a favorite of mine How to Publish a Book in 30 Days. In return, I’ve been reading through her library of self-awareness, encouragement, business, self-improvement. I have a list of her books on my reading list. 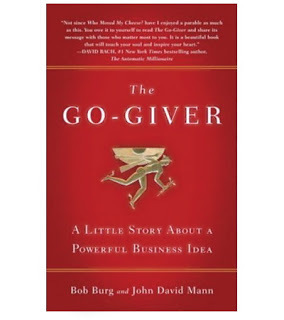 Today I traded in for a new book to borrow and I didn’t have my list in front of me, I didn’t know which one I was most looking forward to reading so I took with me The Go-Giver, she keeps trying to get me to read it. I read it as my name on the door, I was already all blubbery and crying at the happy ending but seeing those first two words suddenly made this book my personal story. I am going to give and serve all I can. I am going to do it for as many people as possible. I am going to put other people’s interest first. I am going to embrace everything about me and be who I am, and I’ll be ready with open arms everything that comes my way. This is for me. I have “an army of personal walking ambassadors” who are “invested” in seeing me succeed. I was so touched to realize that my friend is my ambassador, she really does want to see me succeed. Being lent this book, the message it had, it all spoke to me and I am so grateful for it. It was the icing on the wonderful chocolate cake I had today as I was treated to my friend’s recent success, which she accredited to me for presenting her the opportunity. I hope you all are as blessed and as lucky. Follow your dreams, help everyone else around you reach their dreams. Celebrate together. And, you might as well read this book.